Pepper Weevil or Pepper Maggot? With the damage caused by pepper weevil in 2016 and 2017 still fresh our minds, growers are on alert for the first signs of this pest in their crop. However, there are other pests that can be easily confused with pepper weevil. Most recently, pepper maggot has been found in a Kent County location. Pepper maggot and pepper weevil have many similarities. Both lay their eggs in young peppers leaving a small dimple with a brown plug (Figure 1) and both have small white larva that feed on the inside of the fruit. However, there are some key differences that can help you determine whether you have pepper weevil or pepper maggot. When looking at the damage inside of the fruit, pepper maggot tends to create tunnels in the pepper walls and placenta (the part that holds the seeds), while pepper weevil feeds mostly on the outside of the placenta (Figure 2). Pepper maggot is straight, tapered (thicker on one end), has two small reddish dots on the thicker end and can be up to 12mm long (Figure 3). Pepper weevil is more C-shaped, has a yellow-light brown head capsule and has a maximum size of 6mm (Figure 3). 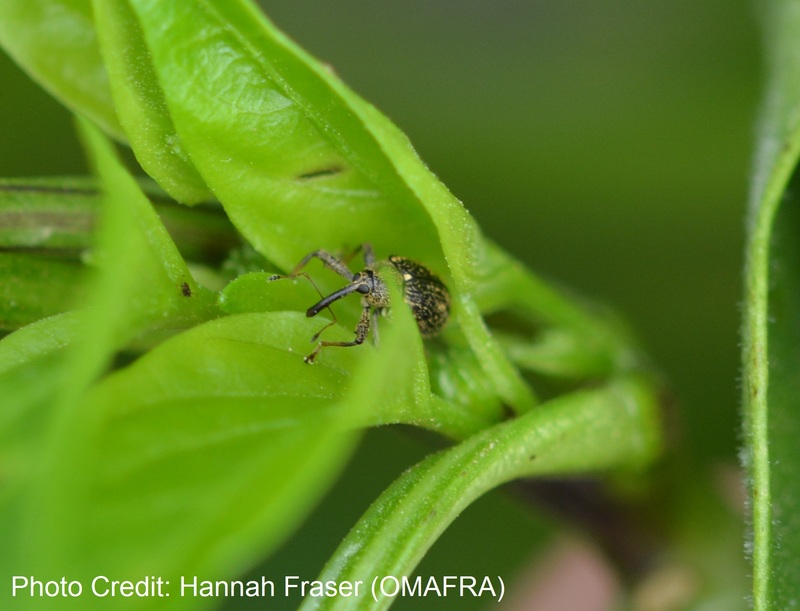 Pepper maggot is generally a minor pest and does not require control, while pepper weevil can devastate a crop and the detection of just one adult or larva warrants the use of registered insecticides. Pepper weevil is a community pest that can cause a great deal of damage if it is not detected and treated early. If you suspect that you have pepper weevil, please contact me at amanda.tracey@ontario.ca or at 519-674-1699. Your details will remain confidential.